Children need to play outside. It is a simple statement and one that is easy to dismiss. Read this article, written by an occupational therapist, to get a better understanding of why this kind of play is so important. Children need to run, skip, and roll. 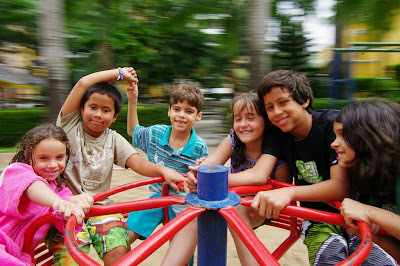 They need to keep themselves upright on a merry-go-round, slide down a slide, and balance on a see-saw. They need to ride bikes, and play basketball, and go swimming, and climb trees. All of these activities strengthen parts of the brain that help children to self-regulate their bodies. Playing outside is good for more than burning up energy! Summer break is starting, soon. Begin making plans, now, for getting your children to play -- outside. It will improve their learning as well as their physical health.